Cheapest I've seen this, especially for the 4K UHD version. Considering the normal blu ray is around £10 cheaper, I'm expecting this to get pretty chilly, pretty quickly. But, if you're in 4K at all, you couldn't ask for better reference material. Absolutely beautiful and one of the best discs in terms of picture quality. Oh, and the film's pretty good, too. Good film! Saw this on a flight a couple of months ago and really enjoyed it! Not bad price for new. If not fussed with lack of digital copy or being new it's a very reasonable £12 in CEX. Yeah, I'd have had it for £12. Paid twice that when it was first released. Super into the 4K, but always feel like I'm paying over the odds just to get a digital copy I'll never use and another disc I'll never watch. Won't take my own advice, though. Caught this listing while browsing Amazon for more movies to 'upgrade'. 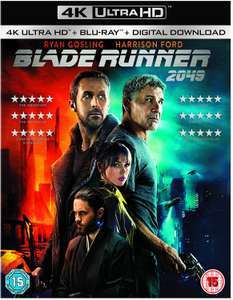 Does anyone know if the digital copy is 4k? I bet by January 2nd 4K blu-rays will have fallen to £9.99 new and £6- at CEX. I bet by January 2nd 4K blu-rays will have fallen to £9.99 new and £6- at C …I bet by January 2nd 4K blu-rays will have fallen to £9.99 new and £6- at CEX. Yeah, I'd have had it for £12. Paid twice that when it was first …Yeah, I'd have had it for £12. Paid twice that when it was first released.Super into the 4K, but always feel like I'm paying over the odds just to get a digital copy I'll never use and another disc I'll never watch.Won't take my own advice, though. Caught this listing while browsing Amazon for more movies to 'upgrade'. What is the reason they include the blu ray in 4k pack? Seems a strange one. Ana de Armas hnnnnng. I would choose this version of Joi no question. What is the reason they include the blu ray in 4k pack? Seems a strange …What is the reason they include the blu ray in 4k pack? Seems a strange one. Part of me thinks that it's just to entice people into spending more money. And then part of me thinks that it's sort of convinient. Even though I never touch them + stick with the 4K disc. I can't imagine doing away with the extras and just selling a single 4K disc is going to bring the overall cost down that much - you'd still be paying £20+ for a new 4K release anyway, so why not include it? At least until the format becomes a bit more widespread...it's the older films they re-release that don't really need to include the Blu Ray disc, but then I'm easy and will upgrade old movies I already own just because they're there. But, I guess it's just nice to have it. Plus you sort of develop the mindset that it's better to have both, rather than one or the other, so why not buy it in 4K? Plus, I've got friends who buy 4K discs, even though they don't have a 4K TV, so they've at least got stuff to watch on it when they get one. It's that 'futureproofing' mindset, I think. Why not buy the 4K, when it only works out like £5-£10 more AND you get the Blu Ray, too? ...it just seems like a weaning technique, moving you from one technological teat to another, without you even noticing until you've bought another shelf full of films you already own. But at least you've got the Blu Ray AND the 4K. Same reason they included a DVD when Blu-rays first came out. Encourages people to upgrade even before they get a 4k player/tv. Also makes the hugely expensive 4k edition seem like better value for money. Give it a year or two when 4k is more mainstream and they'll drop the Blu-ray. It's so they can justify the high price by including something extra which is very cheap to make. Oddly, if and when you buy a UHD player the 'free' films that are included are generally single disc! Only one in stock but it's £15.99 delivered on Music Magpie... be quick!! People interested in 4K UHD aren't going to be interested in 720p streamed version! At least with all the 4K movies I own there is only the movie itself on the 4K disc, the Blu-ray then includes the extras. The Blu-ray is just the exact same discs as the Blu-ray release, probably cheaper it do it that way than to make a new special disc just with the extras. Plus can be used as a way to encourage people to buy 4K version even before they have a 4K setup. Digital copies are HD onlyPeople interested in 4K UHD aren't going to be …Digital copies are HD onlyPeople interested in 4K UHD aren't going to be interested in 720p streamed version!At least with all the 4K movies I own there is only the movie itself on the 4K disc, the Blu-ray then includes the extras. The Blu-ray is just the exact same discs as the Blu-ray release, probably cheaper it do it that way than to make a new special disc just with the extras. Plus can be used as a way to encourage people to buy 4K version even before they have a 4K setup. Deal posting newbie! This is WalkenRoll first deal post. Help out by leaving a posting tip or just to show your appreciation for their contribution.